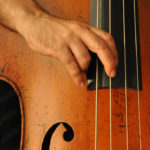 Failing: a very difficult piece for solo string bass (1975) is one of Tom Johnson’s most popular works, a true classic of the solo double bass repertoire. It is a strange piece to write program notes for, since the piece is—literally—self-explanatory. As in quite a few of Johnson’s works, the performer acts as a narrator in the piece, explaining the structure of the piece and offering a running commentary as it goes along. So instead, I’ll start from the idea of the self-explanatory itself—or rather, the self-referential—which is one key to Johnson’s musical poetics. When they explicitly reflect on their own structure, Johnson’s pieces foreground their conceptual nature, but in doing so they immediately make listeners aware of a split. Listening to such works, one always listens to both a sound and to a concept: two very different things for the mind, yet making up one and the same music. The way Johnson plays these two levels against one another is very entertaining, often clever or funny, but is never just a gimmick: it’s also a device that can open you up to a more critical awareness of the situation of music making and music listening. Failing, for example, features its own difficulty (already in the subtitle) and the relationship between virtuoso performance and the risk of making mistakes, implicitly inviting the listener to think about conditions of virtuosic music-making, something that we all too easily take for granted. After all, how weird is a musical culture that assumes the power of a performance to lie in the possibility that it might go wrong? Failures, errors, and mistakes have been a striking sub-theme in much of Johnson’s work. A later piece like Music with Mistakes explicitly questions the audience as to how much they care about the correctness of the execution of a musical idea. Another example is in Doublings, a cycle of six pieces for, again, solo double bass. The cycle is titled that way because every phrase of every piece is double the length of the previous phrase. Each formula directs the player to generate the next phase from the previous one, cumulatively adding one level of structure at each pass. Eventually, the performer – who is instructed to perform the piece from memory – will lose his or her way, at which point the piece finds its natural end. Doublings presents us with an early example of another central concern of Johnson’s art: systematic formulas that generate musical patterns. For the 5th Formula recorded here, at every next level, a new top note is inserted between every two notes of the previous level. This generates a fractal melody that you might be able to predict entirely, if your mind likes that sort of challenge – though you’ll be forgiven if you lose your way in the structure before Tom Peters does so in the monster performance that he recorded for this CD. Thus, such ostensibly predictable formula-music opens up another, very new possibility, which is that the listener now has the option to make mistakes, too! Or, put differently: the music’s predictability invites the listener to supply an explanatory narrative, and that way the formula-based mode of composition turns out to be another version of musical self-referentiality. Of course it is not necessary to analyze the music while listening at all. One can just as easily enjoy the music for its sound, its style, or the expressivity of Peters’ musical choices, which treat the extreme strictness of the structure with almost improvisational freedom in rubato, articulation, and phrasing. Again, Johnson’s music is concept and sound. This formula-based writing became a signature element of Johnson’s work, claimed explicitly in provocatively titled compositions such as Formulas for string quartet, Predictables for piano trio, or Rational Melodies. This last work is a set of melodies that are each generated by a different formula, and only ‘rational’ in the sense of being methodical. The variety of the pieces shows that even within this world of total technique, there are myriads of poetical choices to be made. Different mathematical tools will lend themselves to generating different musical forms. And then there are the sheer, basic, irreducible material choices—choices of rhythms and harmonic intervals—which impact greatly on a piece’s atmosphere. This means that the music’s “rationality” no longer implies the existence of a single “correct” style for music. The concept of the work is mathematically self-referential, but it is this very closure that makes it possible to apply it in diverse stylistic contexts. Johnson’s music is indeed rational and aspires to the universal, without being stylistically prescriptive or restrictive the way the musical avant-garde could be at times – he even wrote an entirely combinatorial Tango. Similarly, every piece always invites new variations of the concept, and Johnson’s oeuvre as a whole proceeds by finding ever-changing ideas and techniques. Though each movement is radically determined by a singular concept, there is no one underlying concept for the entire set. I believe this explains Johnson’s penchant for writing in suite-like forms or series, in which each piece is its own conceptual variation of a very general idea. The Rational Melodies are among Johnson’s most popular works on CD. One striking thing about them, when you compare various instrumental versions or ensemble arrangements, is how different a single piece can be made to sound while still retaining its identity. This is born out strongly by the present recording too, with every piece being played by instruments from very different cultural backgrounds. In addition, this recording differs from the others by tuning each of these nine Melodies to a particular Just Intonation in which every interval can be expressed as a frequency ratio of whole numbers. This is remarkable, because Johnson’s music is generally conceived in twelve-tone equal temperament, in which frequency ratios are based on the twelfth root of two: so in that sense, the tuning isn’t “rational” at all! Many of Johnson’s pieces are based on scales that are systematic patterns of one or two intervals: so in choosing truly rational just intonation tunings, subtle colorations and differences introduce themselves such that there may be different types of major thirds or minor seconds within the same scale. Yet the ear accepts these readily, and the underlying conflict—between a more ‘geometric’ rationality based on equal distances and a more ‘arithmetic’ one based on frequency ratios—does not hinder the music so much as subtly enlivening it. Maybe the most striking example is Eric Ederer’s interpretation of Rational Melody II on oud that dramatically includes scale steps that are tuned as 12/11 and 7/6 to the fundamental, quite distant from ‘normal’ tunings. 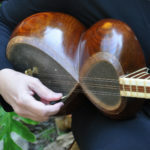 Coupled with the use of the Oud, such tunings are reminiscent of Turkish or Arabic classical music (Ederer speaks of “an imaginary [or newly created] maqam I would call Zirgüleli Pençgâh”), which is underscored by the use of traditional ornaments. 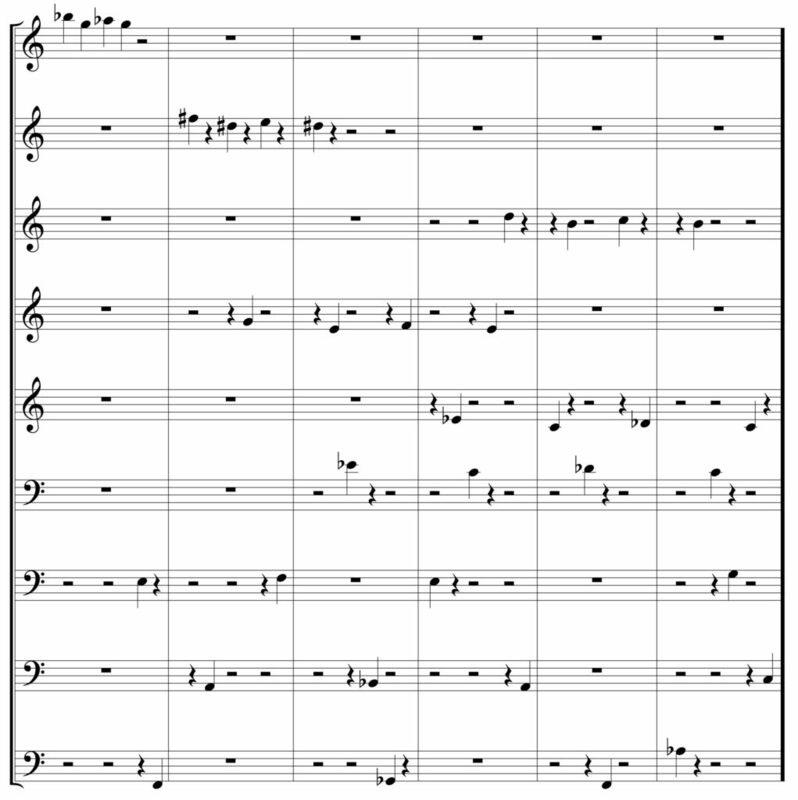 The original music notation is composed in an octatonic scale, one that was often used in classical music precisely to suggest an oriental atmosphere. Taking this scale back to an instrument from the region and interpreting it within the context of Turkish music theory and performance style is a subtle commentary on classical European orientalist music practice. It is the structure of the Melody II that suggests this translation process, with it being based on rigid mathematical processes. The melody is, in fact, another kind of “Doubling,” this time based on the so called “dragon pattern,” a pattern generated by folding a piece of paper in half and then folding it again in half, and again, and again. When unfolded, the process yields a curve of ups and downs that gets twice as long with each extra fold. The melody is essentially no more than a translation of this curve into an octatonic scale pattern in 6/8 time. The other eight examples are just as colorful and suggestive, with every instrument bringing its own resonant properties to the melody, every performer bringing their own expressive understanding to the phrase structure, and every piece in its own tuning. Koto player Kozue Matsumoto plays number Melody XVIII, a rotating and gradually unfolding arpeggio, in a Pythagorean pentatonic scale. Its structure is not unlike that of number III, another rotating scale melody that expands but also contracts, in a whole-tone scale. As played by Pirayeh Pourafar on the Persian tar in Pythagorean tuning with its wide thirds, the scale sounds even more relaxed and dreamlike. Melody IV, by Peters on bass, is yet another version of this idea of a cyclical melody that gradually expands in a Pythagorean hexatonic scale. 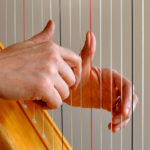 Melody XIII, played by Alison Bjorkedal on harp in 5-limit just intonation, is a combination of additive and multiplicative counting processes. Melody I, a catchy, very simple isorhythmic pattern, is played in 5-limit JI on the West African kora by Ric Alviso. 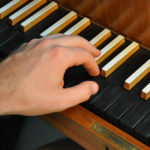 The harpsichord in Melody XII is played by Richard Valitutto, again in Pythagorean tuning. Here, a sequence of open fifths is gradually filled with descending chromatic notes, which on this Baroque instrument suggest the ‘lamento’ figure. In this tuning, there are two sizes of half-steps, distributed differently within each fifth, creating very subtle nuances of coloration for each quarter of each phrase. Melody X, interpreted on guitar by John Schneider, is a kind of arpeggiated chorale that also descends chromatically; this time the tuning is 5-limit, with all major thirds and most of the fifths pure. But one of the fifths is quite wide, creating a subtle harmonic tension within the third quarter of the piece that resolves beautifully in the pure fifths of the final bar. 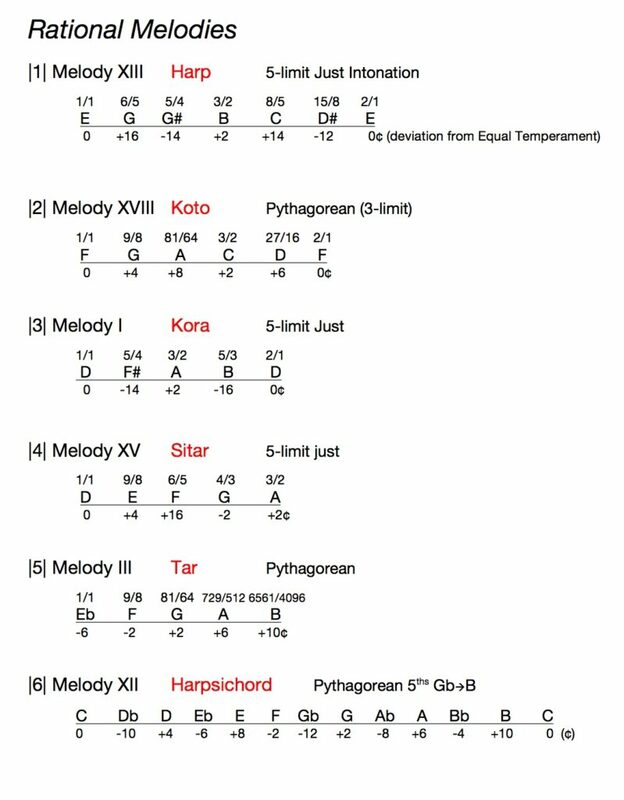 Melody XV, also played in 5-limit just intonation by Paul Livingstone on the sitar, is a very particular case, a so-called ‘self-similar’ melody. That is, if you loop the tune but would skip every second note, you would end up with the same melody at half tempo! The melody here proceeds by starting at the half tempo and then filling up the tune, to end up with the same thing at double speed. The variety of sounds on this disc is the result of Plucking for nine different plucked instruments (2015), the main and newest work. In his introduction, Johnson explicitly addresses the question of cross-cultural writing: “I have generally avoided mixing instruments of different cultures in my music. Combinations such as kora and guitar or flute and shakuhachi seem to show little respect for the differences between cultures, and can sometimes even suggest colonial exploitation. But when I decided to write a piece called Plucking and to exploit only plucking sounds, it seemed like a very good idea to leave the instrumentation open to as many kinds of plucking instruments as could be found in a particular performance situation.” Again, it is a very strict conceptual approach, together with the universality of the physics of plucking strings that makes the dialogue between the sounds of very diverse cultures possible. Plucking is related to Johnson’s sequence of Tileworks. Tilings are mathematical patterns in which some space is fully covered by one (or a limited number) of finite figures called ‘tiles’. The clearest examples include the covering of a plane by triangular, square, or hexagonal tiles (the classification of ways in which a plane can be covered by pentagonal tiles is an unsolved mathematical problem). But one can also imagine covering a line by linear ‘tiles,’ subsets of the line that need not be continuous themselves, but which can be combined at staggered distances to cover the whole line. Such procedures suggest the rhythmic constructions used by Johnson in his series of instrumental solos called Tileworks. These pieces are something like hockets writ large: a rhythmic line or loop (a sequence of pulses) is ‘tiled’ by multiple rhythmically-similar motives, such that they interlock and fill up the rhythmic structure. This way it is possible for solo instruments to play polyphonic canons: thus, many voices combine to form one composite melody. Johnson’s interest in this technique was the result of his reading the seminal essay on the topic by Dan Tudor Vuza in Perspectives of New Music called “Supplementary Sets and Regular Complementary Unending Canons,” which describes the basic ideas behind linear tiling. As Johnson likes to observe, this was a very rare case of music theory actually influencing compositional practice. Plucking itself was based on a later article by mathematician Jean-Paul Davalan, in a special issue of Perspectives of New Music celebrating twenty years of Vuza’s article. It specifically considers the possibility of tilings when voices play two, three or four-note regular pulses, but at different tempos. Plucking is in four large sections which each explore different kinds of tilings. In many tilework pieces, Johnson has created separate movements for each kind of tiling solution, so one of the things that makes Plucking stand out is that the piece is entirely through-composed. Within each section, one gradually hears tiling patterns being built up, and then transform into the next solution. This happens through varying processes: sometimes layers are added until the full tiling is heard, and then removed. Sometimes, notes are ‘collected’ into chords, and then voice by voice they get ‘spread out’ over the looping meter, until every beat of the cycle has only one voice playing. The piece owes its effect as much to these varying strategies for morphing from tiling to tiling as from the tilings themselves. Every time, the full tiling is heard for just a few repeats before it changes shape. These moments are like brief appearances of a small musical miracle, which immediately starts slipping away. Since the tilings are canonic structures of nine voices that interlock perfectly, they remind me of fugal expositions, and the whole of Plucking is something like an experimental take on the fugue form. In the first section, a few tilings are built up and transformed layer by layer; these tilings feature simple regular pulses in multiple tempos, as each instrument here is limited to one pitch only, in quite a few variant arrangements. In the second section, voices no longer play single repeated pitches (or “pulses”), but actual two-note motives. The section starts with collective chord statements, from which the voices gradually move into tiling polyphony in which every pitch is on its own beat. Every voice has two notes, but each voice is in its own rhythm. A number of such solutions is explored, some with nine different tempi, some reduced with only four, or five, or six different layers. The section ends with the repeated note-figures actually becoming three-note melodic motives, opening up the piece to a wholly different way of hearing the canons. The third section explores such more melodic contrapuntal texture using three-note motives. Davalan’s article has shown that there exist eighteen ways to tile a 27-point loop with nine different instruments, each playing the same three-note motive at a different speed, and after a buildup, these eighteen solutions are each played exactly once. The final, fourth section extends the motive once more to a four-note one. As Davalan proves, the shortest such perfect tilings with four notes require nine instruments and a 36-point loop, and this is why Johnson needed nine instruments for this piece. In this section, the piece builds up to a pattern with ‘Skolem sequence’ (1, 1, 1, 1, 7, 11, 2, 8, 2, 4, 2, 7, 2, 4, 6, 8, 11, 4, 7, 5, 6, 4, 3, 8, 5, 3, 6, 11, 3, 5, 11, 3, 6, 7, 5, 8) – having voices in tempo ratios 1:2:3:4:5:6:7:8:11. After the full pattern is built up, Johnson starts collapsing the polyphony, first by transposing all the voices—one by one—to play the motive on the same pitch, then by rhythmically collecting voices into choirs, which eventually end in a single choir. The piece ends powerfully with a final collective statement of the four-note motive. 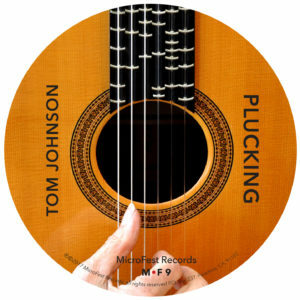 I believe Plucking to be a very special work in Johnson’s output. The form is an audacious structure, combining varying rigorous techniques to bring an extremely simple sound concept alive by inventive variations, while keeping the flow within one big arch. It also is one of the most advanced statements of the tiling concept, and the choice of differently colored plucked strings is an especially felicitous one. 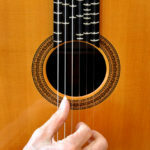 The articulation of plucked strings is perfect for creating single melodies out of the action of multiple strings. The contrapuntal effect in Plucking is mesmerizing, and listeners could focus both on the melodic character of the individual motives, or on their interplay as they merge into one super-melody, each timbre leading naturally into that of the next instrument, or simply on the richness of timbral nuances. 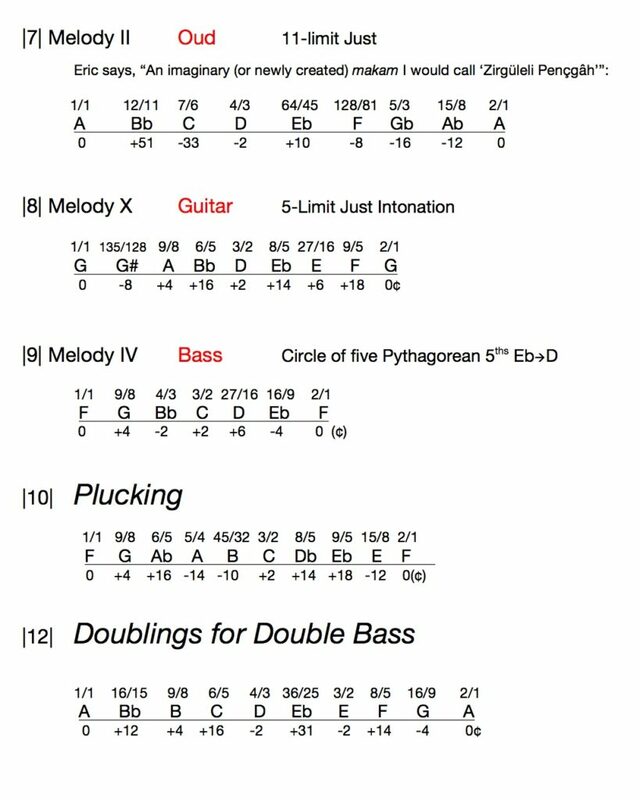 Additionally, Plucking is also performed in 5-limit Just Intonation, such that the nine notes of the opening section are all tuned to the harmonics of the double bass F that begins the piece. This subtle retuning sharply refocuses the harmonic structure of the first section when the initial notes begin their recombination, creating islands of triadic purity on the chords F, Fm, Db, C, Cm, G, Eb, & Ab. But when each instrument plays melodically, its individual intonation has quite the opposite effect, creating new notes that are dissonantly unrelated to both the Fundamental bass and the other players. This added layer of harmonic tension increasingly segregates the participants, until the increasing textural, rhythmic, and melodic conflicts reach their glorious resolution. Using its mathematical structures, Plucking has created an image of how sounds from different traditions can sing together forming one great, completely new ensemble sound, articulating some very refined melodies, full of internal layers. The piece is at the same time utterly unsentimental and very moving, sparse and rich, abstract and alive. It’s a great joy to hear how, already in his eighth decade, Johnson just keeps discovering new worlds. In general I avoided the combinations of instruments coming from different cultures in my music. 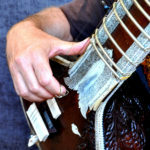 Combinations like kora and guitar or flute and shakuhachi do not seem to respect the differences between cultures, and may even suggest colonial exploitation. But when I decided to write a piece called Plucking, and to exploit plucked sounds only, it seemed to me very well to leave the instrumentation open to all the plucked sounds that One can find in a given situation. 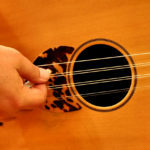 The physics of pinching a string is the same, no matter the appearance of the instrument or its origin, and all these instruments can meet very well in a set. 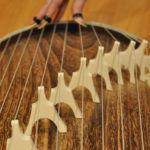 Almost everywhere in the world one can find classical strings and several kinds of guitars, and with a little effort one can add harp, harpsichord, banjo, mandolin, and today one can go further and find instruments like oud, Koto, kora, pipa, shamisen, balalaika, sitar, sometimes in several different sizes, and all these instruments can play chromatic range without problem. The only consideration is that each instrument has a distinctive sound and that everyone is heard easily. This resembles a “Skolem sequence” in honor of Thoralf Skolem (1887 – 1963), who studied these phenomena. When all the instruments come together to make such a paving, I write the list above the music for reference. I could try to explain more about the “Skolem sequences,” on “perfect paving” and on Davalan’s amazing loop that allows nine voices to play a single theme of four notes, each in another tempo, in a loop of 36 notes, as you hear at the end of the score. But it is better simply to give the reference to the Davalan website, where these things, and many others, are explained with great clarity and good examples. TOM JOHNSON (Composer) received B.A. and M.Mus. degrees from Yale University, and studied composition privately with Morton Feldman. After 15 years in New York, he moved to Paris, where he has lived since 1983. He is considered a minimalist, since he works with simple forms, limited scales, and generally reduced materials, but he proceeds in a more logical way than most minimalists, often using formulas, permutations, predictable sequences and various mathematical models. Johnson is well known for his operas: The Four Note Opera (1972) continues to be presented in many countries. Riemannoper has been staged more than 30 times in German speaking countries since its premiere in Bremen in 1988. Often played nonoperatic works include Bedtime Stories, Rational Melodies, Music and Questions Counting Duets, Tango, Narayana’s Cows, and Failing: a very difficult piece for solo string bass. As performer he frequently plays his Galileo, a 40-minute piece written for a self-invented percussion instrument. Johnson received the French national prize in the Victoires de la Musique in 2001 for Kientzy Loops. JUST STRINGS is an expandable ensemble that specializes in the performance of music in Just Intonation. Since their formation in 1991 as a guitar, harp, and percussion trio to perform the music of Lou Harrison and Harry Partch, they have gone on to commission and premiere works by John Luther Adams, Mamoru Fujieda, Larry Polansky, James Tenney and others. In 1995 they toured Japan under the auspices of the American Embassy’s prestigious Interlink Festival. They have performed for Chamber Music in Historic Sites, the LA County Museum of Art, Partch Centennial Celebration (UCLA), Festival of New American Music, Minnesota Public Radio’s American Mavericks, Songlines at Mills College, the Getty Center, and WNYC’s New Sounds. In 2004, they made their Disney Hall/REDCAT debut premiering Harry Partch’s Bitter Music. ALISON BJORKEDAL (Harp) is a freelance GRAMMY award-winning musician who teaches and performs in the Los Angeles area. She earned her Masters and Doctorate in harp performance from the USC Thornton School of Music and her Bachelor of Music degree from the University of Oregon. Named “excellent player” and “Alluring” by the Los Angeles Times, Alison’s notable chamber music performances include the world premieres of William Kraft’s Encounters XII for harp and percussion, Anne LeBaron’s HSING for solo harp, and Wadada Leo Smith’s Ten Freedom Summers, a 2013 Pulitzer Prize finalist. She also performs orchestrally and for the motion picture and television industry. ERIC EDERER (Oud) had long been a composer and performer in the Western tradition when he began his studies in the maqām-based music of the Near East around the year 2000. That course, including several periods of living and studying in Turkey, led him through graduate school and a Master’s degree (2007) and PhD (2011) in ethnomusicology from the University of California Santa Barbara, in whose Special Research Collections Department he currently works as a sound archivist. 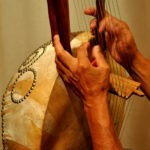 In addition to teaching these music traditions, Dr. Ederer performs regularly with the UCSB Middle East Ensemble, Flor de Kanela, Kalinka, and his own Makam Liberation Front, in which he plays both traditional plucked string instruments and several of his own design (such as the Nautilauta, Neşri-Feza, and Ur-Caster, all in just intonation). His most recent album of original compositions is called Tune, and in 2015 he published the book Makam and Beyond: a Progressive Approach to Near Eastern Music Theory. PAUL LIVINGSTONE (Sitar) is one of the few American disciples of the legendary Pt. Ravi Shankar, also rigorously trained in the tradition of the Maihar Gharana under Pt. Rajeev Taranath and Amiya Dasgupta for the past 26 years. A committed sitarist since the age of 15, he has toured extensively in the US and Latin America as well Europe, South East Asia & India and has performed alongside leading artists from India & Nepal such as Pt. Swapan Chaudhuri, Abhijit Banerjee, Hom Nath Upadhyaya, Shashanka Bakshi, and many more. He leads his own Arohi Ensemble playing ‘raga jazz chamber music’ as well as being a commissioned composer for film, television, theater and dance and has recorded with popular artists such as Ozomatli, Alanis Morrisette, Beck, Rubén Albarrán (Café Tacuba), Ricky Kej & Build an Ark including two Grammy Award winning records. KOZUE MATSUMOTO (Koto) was born and raised in Tohoku area in Japan. Having lived in Tokyo and Vancouver, she is now based in Los Angeles, internationally performing classical, contemporary, experimental, and improvisational music as well as collaborating with various forms of the arts. She has strong interests in exploring the potential of Japanese traditional music and performing arts beyond their conventional contexts. Kozue has played koto since she was three years old under Ikuta-ryu Miyagi-kai, and holds a semi-master title. She has also played shamisen and shinobue since she was small. TOM PETERS (Bass) is a composer and GRAMMY nominated double bassist who is dedicated to performing new and classic avant-garde works for the instrument. He is also known for creating and performing computer-based multimedia works featuring classic silent films. His latest, The Man with the Movie Camera, based on Dziga Vertov’s landmark 1929 documentary, was presented at the Portland Art Museum in Portland, Oregon. Tom is a member Southwest Chamber Music, the Long Beach Symphony, and is on the faculty of California State University, Long Beach. PIRAYEH POURAFAR (Tar) entered the Royal National Music Conservatory of Teheran at the age of nine, where she started her studies of the Radif of Persian Traditional Music with Masters Houshang Zarif, Habiboallah Sallehi, Mahmoud Karimi and Grand Master Ali Akbar-Khan Shahnazi. In 1982 she came to the U.S. where later she received her Master of Fine Arts from the California Institute of Arts. She has given lecture-demonstrations, and workshops throughout the United States, Europe, and Middle East. Pirayeh has co-composed music for tree plays “Philoktetes” Directed by Michael Hackett and Olivier Award-winning British actor, Henry Goodman, “Medea” starring Annette Bening directed by Lenka Udovicki, as well as “Layla Means Night” directed by Rosanna Gamson. In 1996 Pirayeh co-founded The Lian Ensemble. RICHARD VALITUTTO (Harpsichord) is a GRAMMY-nominated performer of compositions for the piano that span the instrument’s entire existence. Described by the Los Angeles Times as a “vivid soloist,” “quietly dazzling,” and “vigorously virtuosic,” he is a piano soloist, chamber musician, vocal accompanist, and composing/improvising creative who has worked closely with a myriad of composers including John Adams, Brian Ferneyhough, Michael Gordon, Sofia Gubaidulina, John Harbison, David Lang, George Lewis, Meredith Monk, Steve Reich, Wolfgang von Schweinitz, and Chinary Ung. He has been the featured performer with organizations and series such as the Los Angeles Philharmonic, Opera Omaha, Monday Evening Concerts, Piano Spheres, Omaha Under the Radar, wasteLAnd, People Inside Electronics, and the Louis Moreau Institute. 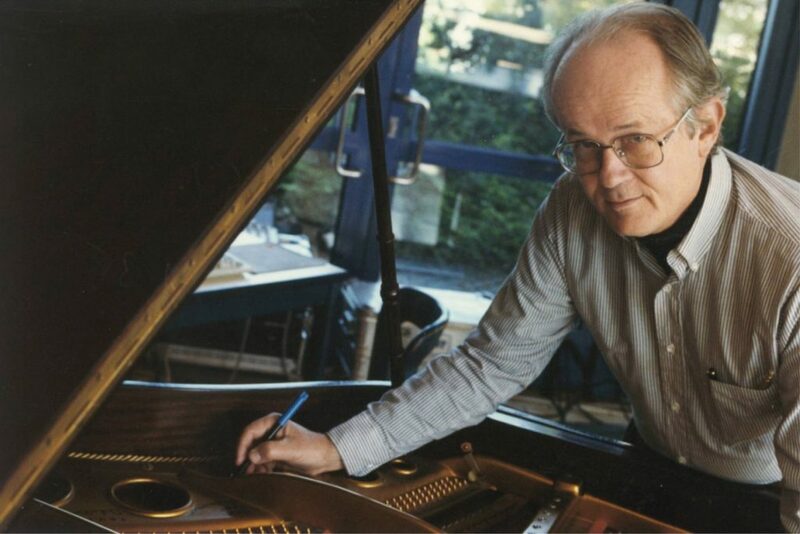 SAMUEL VRIEZEN is a composer, pianist, poet, and writer living in Amsterdam. He has collaborated with Tom Johnson regularly, and is known for his virtuoso interpretation of Johnson’s cult classic, The Chord Catalogue [Wandelweiser Records]. He has published on a wide variety of topics, including literary theory, art and politics, and the mathematics of music. Rational Melodies & Plucking, recorded May 5 to July 30, 2016 – The Library, Earthstar, & elsewhere, Los Angeles. This recording was funded in part through a generous grant from the Aaron Copland Fund for Music, Inc.